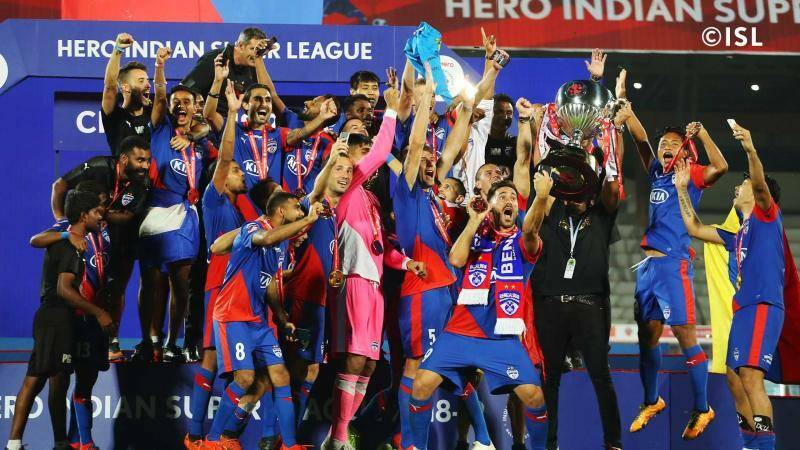 Exactly one year after the heartbreak at the Sree Kanteerava, Bengaluru FC exorcised their demons by winning the Hero Indian Super League (Hero ISL) 2018-19 title at the Mumbai Football Arena on Sunday. The road to redemption, however, wasn’t an easy one against a spirited FC Goa side, who gave it their all, and then some, in the hard-fought final. There was nothing to separate the two sides at the end of the regulation 90 minutes, triggering Extra Time. With a dreaded penalty shootout looking imminent, Rahul Bheke took flight and ensured the long-awaited moment of glory didn’t evade the Blues for the second season running. Both teams tried to start the match on the front foot, making for an entertaining opening few minutes with chances on both sides of the field. Bengaluru came close to unlocking the Goa defence on the 6th minute when Miku danced past multiple Goa defenders and seemed to be through on goal. Naveen Kumar advanced from his goal line just in time to thwart the Venezuelan. As the minutes rolled on, Bengaluru began edging out Goa on possession stats, but only just. Both teams, however, looked equally dangerous going forward but the final ball was missing. Birthday boy Jackichand Singh almost broke the trend just before the 15-minute mark. He latched onto one of Ahmed Jahouh’s classic long ball forward down the right wing and sent in a sumptuous cross for Ferran Corominas. The Spaniard tried to volley it first-time but got his timing terribly wrong. The tempo of the match suddenly picked up after the 20-minute mark with both sides trading chances in what was beginning to turn into an end to end affair. However, the all-important goal didn’t come as both sides cancelled each other out. Goa was dealt a blow just before the half time whistle as captain Mandar Rao Dessai pulled up with what seemed like a hamstring injury. He tried his best to carry on, but youngster Saviour Gama eventually came on to replace him. The scoreline stood 0-0 at the break. After the restart, Bengaluru looked the more adventurous of the two sides as the Gaurs uncharacteristically opted to sit back and defend with numbers behind the ball. Miku got a big chance to disturb the stalemate on the 57th minute. The Venezuelan managed to ghost behind the Goa defence to get on the end of a cross at the far post. The striker tried to volley it goalwards but, like Coro in the first half, misjudged his shot. It was a big let off for the Gaurs. The scare seemed like the wake-up call Goa needed as they responded immediately with back to back chances. First, Jackichand broke into the box and got his shot off. But his effort was too tame to worry Gurpreet Singh Sandhu in the Bengaluru goal. Seconds later, Brandon Fernandes almost set up Edu Bedia with a heading opportunity. The Spaniard did well to peel off his marker but was centimetres away from getting a telling touch. Goa started to exert their dominance on their match but couldn’t sway the scoreline in their favour. With the clock slowly ticking down, both teams started to show signs of nerves kicking in. On the 80th minute mark, Miku got yet another chance to put Bengaluru ahead. Chhetri’s looped header fell kindly for Xisco Hernandez inside the Goa box, who skilfully laid the ball off for Miku. The Bengaluru no. 7 beat Naveen with a cheeky flick only to hit the post. As stoppage time ensued, both teams made a couple of frantic attempts to find a late winner. Fall put up a brilliant block to divert Miku’s shot at goal. From the resulting corner, the Gaurs broke with purpose and it needed a brilliant bit of tracking back by Dimas Delgado to deny them a scoring opportunity with what would have been the final chance of the regulation time. In Extra Time, the Gaurs came out with a lot of intent, but the Bengaluru defence held on resolutely. The Blues could have nicked the tie in the dying minutes of the first period of extra time. Xisco took a venomous shot from outside the box but Naveen pulled off an acrobatic save to keep the score level. Seconds before the referee blew his whistle to mark the end of the first period of Extra Time, there was a twist in the dynamic of the match. Jahouh seemed to have kicked out at Miku after going down from a tough challenge from the Venezuelan. Both players were shown a yellow card for their actions in the incident. However, it was the second booking of the night for Jahouh. The Moroccan had to go off the field, leaving Goa to fend off the remainder of the match with 10 men. Bengaluru tried to make their one-man advantage count in the second half of Extra Time but the 10-man Goa defended with purpose, denying their opponents any space or time on the ball. Fall, in particular, was ever-present in the Goa backline and marshalled the backline with impeccable composure and authority. Just as it looked the match was headed for a penalty shootout, the big goal finally came. Rahul Bheke leapt high to meet Dimas’ corner on the 117th minute and sent a looping header towards the goal. Naveen tried to keep it out at full stretch but and even got a fingertip to it. But it wasn’t enough to stop the ball from nestling into the top corner. Three minutes later, the final whistle sounded, confirming Bengaluru’s status as the Hero ISL 2018-19 champion – the new champion. With the dreaded penalty shootout looming large, Rahul Bheke rose to the occasion to score the winning goal of the night to win Bengaluru the coveted Hero ISL title. Apart from the crowning moment, Bheke was a rock at the back for the Blues throughout the match.